First off, I want to thank the author, Hachette Audio, and Joe Jameson for the ALC (advanced listening copy) of Spellslinger in exchange for an honest review. 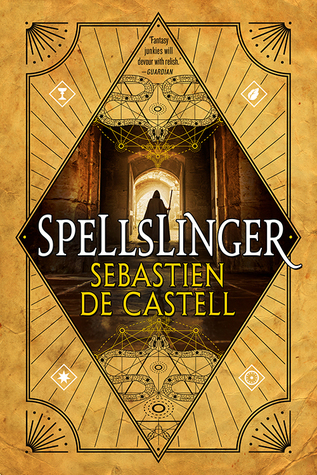 Receiving this ALC in no way influences my thoughts or opinions on the novel, but having Joe Jameson narrate certainly boosts it a tad :D.
This is my first foray into Sebastien de Castell’s writing and it certainly won’t be my last. I have heard many great things about this series, as well as his Greatcoats series, and so far, so great. If Spellslinger is any indication of how good this series can and will be, readers are in for a fantastic next five (5) months and beyond. (Reason I say that is because the first four (4) books in the series, out of a total six (6), release over the course of the next several months). And yes, I am a HUGE Joe Jameson fan, so when I saw that he was narrating this series (on top of the already released Greatcoats series), I was all in. If you are into audiobooks and fantasy, definitely look him up and add RJ Barker’s ‘The Wounded Kingdom’ trilogy and Adrian Selby’s ‘Snakewood’ stand-alone novel to your wish-list. I highly recommend them all and can guarantee that you won’t be disappointed. In the beginning, we are introduced to a young man by the name of Kellen. He is in the midst of his first mage’s duel and on the path to becoming a spellcaster. Problem is: his magic seems to elude him, and appears to dwindle as time ticks away. He is forced to use his wits and tricks in order to move forward with his training. But these tricks will only move him so far along in his trials before he is found out. Enters a mysterious stranger by the name of Ferius Parfax, an out-of-towner with a penchant for card tricks and practically sweeps Kellen off his feet. She takes Kellen under her wing and shows him a path that is, suffice it to say, less traveled. Though she is thought to be a spy by everyone around, she shows Kellen the world anew and he slowly begins to understand his place in it. But of course, when everything seems to be going fine, enter stage right: evil. When his sister is kidnapped, and with his friend’s backs turned to him, Kellen and Ferius must do what it takes to save her and the rest of town. Have to say, character development is a strong suite in de Castell’s deck of cards. From Kellen to Ferius, though Ferius didn’t have AS much screen time, there was enough fleshing out for 2-3 books let alone just 1. But who stole the show for me was Reichis (and you’ll have to read to find out who I am talking about.) I don’t know if it was just Jameson’s portrayal, but I found myself rolling whenever Reichis made an appearance and I hope there is more from him in the sequels. The first half of the novel is a ton of world-building and background info dumps that are key to the story, so I urge you to keep going if you feel it bogging down. Also, yes, it is technically YA but I encourage you to give it a shot as there is plenty of fun to be had and no love triangles to speak of. I know that is typically what steers me away but sometimes you just have to trust the opinions of others to give something a try before judging. 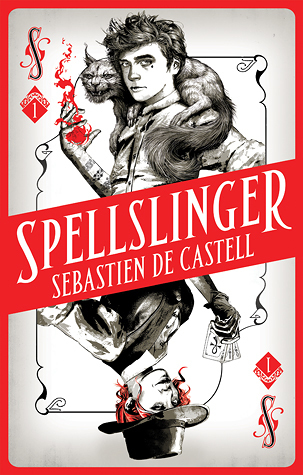 Overall, if you have read other works by the author, chances are you have or will give Spellslinger a shot. If you are new to de Castell, I urge you to pick this one up and let me know what you think. It is fun, witty, and overall captivating, and I cannot wait until Shadowblack hits shelves on August 21st. LOVED this!! My review should be up later this week. Woot! Can’t wait to read it! And yes, this read was fantastic. Bring on Shadowblack! This was such an awesome book! I just received the second book in the mail today and I’m dying to start it! Oh my gosh, me too! Can’t decide if I want to wait for the audio or not, though!